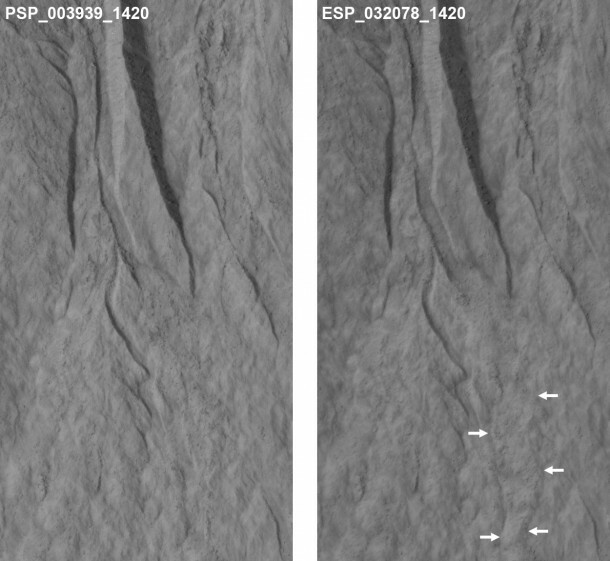 Repeated high-resolution observations made by NASA’s Mars Reconnaissance Orbiter (MRO) indicate the gullies on Mars’ surface are primarily formed by the seasonal freezing of carbon dioxide, not liquid water. The first reports of formative gullies on Mars in 2000 generated excitement and headlines because they suggested the presence of liquid water on the Red Planet, the eroding action of which forms gullies here on Earth. Mars has water vapor and plenty of frozen water, but the presence of liquid water on the neighboring planet, a necessity for all known life, has not been confirmed. This latest report about gullies has been posted online by the journal Icarus. 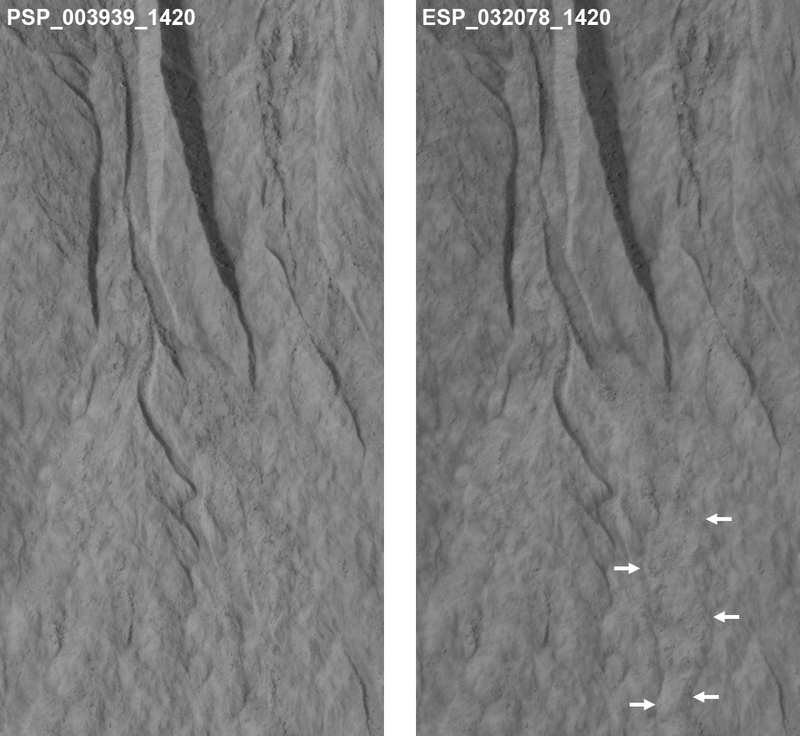 Dundas and collaborators used the High Resolution Imaging Science Experiment (HiRISE) camera on MRO to examine gullies at 356 sites on Mars, beginning in 2006. Thirty-eight of the sites showed active gully formation, such as new channel segments and increased deposits at the downhill end of some gullies. Using dated before-and-after images, researchers determined the timing of this activity coincided with seasonal carbon dioxide frost and temperatures that would not have allowed for liquid water. Frozen carbon dioxide, commonly called dry ice, does not exist naturally on Earth, but is plentiful on Mars. It has been linked to active processes on Mars such as carbon dioxide gas geysers and lines on sand dunes plowed by blocks of dry ice. One mechanism by which carbon dioxide frost might drive gully flows is by gas that is sublimating from the frost providing lubrication for dry material to flow. Another may be slides due to the accumulating weight of seasonal frost buildup on steep slopes. The findings in this latest report suggest all of the fresh-appearing gullies seen on Mars can be attributed to processes currently underway, whereas earlier hypotheses suggested they formed thousands to millions of years ago when climate conditions were possibly conducive to liquid water on Mars. Dundas’s co-authors on the new report are Serina Diniega of NASA’s Jet Propulsion Laboratory (JPL) in Pasadena, California, and Alfred McEwen of the University of Arizona, Tucson. Although the findings about gullies point to processes that do not involve liquid water, possible action by liquid water on Mars has been reported in the past year in other findings from the HiRISE team. Those observations were of a smaller type of surface flow feature. An upcoming special issue of Icarus will include multiple reports about active processes on Mars, including smaller flows that are strong indications of the presence of liquid water on Mars today. HiRISE is operated by the University of Arizona, Tucson. The instrument was built by Ball Aerospace & Technologies Corp. of Boulder, Colorado. JPL manages the Mars Reconnaissance Orbiter Project for NASA’s Science Mission Directorate in Washington.